Please check out "Fun in Maine"
We started a new Journal called “Fun in Maine” to describe our Northeast experiences. Please join us there. We slowly got ourselves going to get packed up and ready to depart for Wells. Maureen ran off to see Grandpa Ed to say goodbye. He had been a little short-changed but not for lack of trying. With the 11AM checkout time approaching, Angus and I got the RV organized and went for a walk. Maureen returned, we hooked up and were on our way for the last leg. We chose to take I91 to Greenfield and then take Route 2/202 east through northern Massachusetts. For much of the way, this is a 2 lane country road through some beautiful, typical New England countryside. We then got on I495 and headed northeast into New Hampshire and soon thereafter, we crossed into Maine. 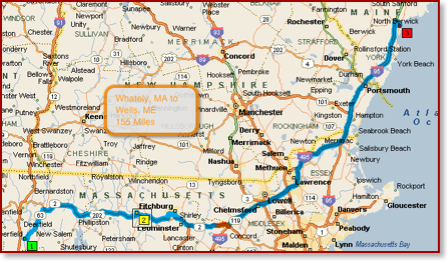 Wells is only about 20 miles from the New Hampshire border. 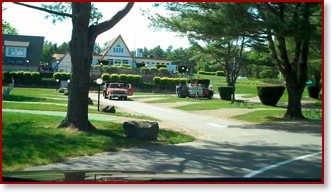 We arrived at Wells Beach Resort at 3:30 and we directed to a back-in on “5th Avenue”. This spot, site 27, put us next to Bobby Poirier, a seasonal resident, Don and Fran Clark, full-timers and fellow workampers. Across from us are Marion B..ski (a guy) from Hatfield and a friend a Grandpa Ed and Mike and Donna Groton, 8th year Wells Beach Resort workampers from Tuscon, AZ. Shirley Griffin (the owner) got us situated and we set up for our 6 month stay. We spent a little extra time on leveling. This is usually something we make a quick best effort on but when the duration is going to be relatively long term, it is important to get as right as possible. We managed to get it dead-on-balls accurate. We have a bit organizing to do but nothing urgent. We did run over to the grocery store (Hannafords). This is 1/2 mile (not 40 like Alaska) away. We’ll describe the Resort in detail as we become familiar with it. But we’ve got to tell you that the facility is gorgeous and worthy of the term Resort. 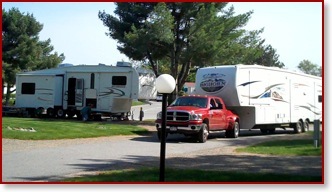 And worthy of being chosen as one of the top 300 RV parks in the country. We went off to breakfast in a small, pleasant, local restaurant in downtown South Deerfield. Following a pleasant, easy breakfast and we headed off to Hatfield to visit with Grandpa Ed. He wasn’t home so we went to Hadley to get access to Barnes and Nobel’s internet. Maureen needed to catch up on some bills. After spending a couple of hours paying bills, surfing and browsing the latest books, we decided to drop in on Allie and Kyle. After visiting for a while, we went to dinner in Northampton at Fitzwillies. This pub/restaurant had recently become nationally famous when “Lord Jesus Christ” had been hit by a car in front of the pub. We had a really pleasant evening of conversation and laughs. We bid good-night and headed off to see Ed and Marsha and Hanna’s family. White Birch has great potential but... We had no accessible internet (although promised) and no TV. Additionally, with some landscaping, the park could be beautiful. 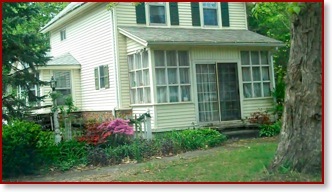 The location has lots to offer both historically and just plain beauty. However, it’s got a long ways to go before we will stop there again though. Because we could, we lounged around in bed until after 9AM. It was pleasant to have nowhere to get to. We had things to try to get done, so we got off at 10AM for a leisure breakfast and drive to Greenfield to visit Home Depot. We got almost everything we needed and some things we didn’t and returned to our RV. Just as we arrived, Brian called and suggested that we get up to see Grandpa Ed. So we stored our goodies and drove to North Hatfield and Molloy Ave.
We spent the remainder of the day and some of the evening visiting with Grandpa Ed, Marsha, Ed, Hannah, Mike, little Matthew and Benjamin. There were lots of laughs, fun with the kids and delicious Italian fare. We returned to Whately (only about 8 miles) and spent a few moments whining about the internet before calling it a night. We will spend another day in the Hatfield area. There’s lot’s to do and many to visit. We will head to Wells on Wed.
We woke to heavy winds and a steady rain. It was easy to decide to spend an extra day in Harrisburg and avoid the dealing with the wind and rain for 7 hours. The route we had selected was 375 miles, fairly aggressive after 6 straight days of closing up the RV, driving and then setting it back up. So we weren’t particularly upset about spending the day there. Also, we had to get some items at an RV store and a Home Depot to make a couple of repairs. After verifying that we could extend a day, we ran off to an RV store. While on our way, the skies brightened and the rain stopped. Since one of the conditions of our stay was to move to an alternative site, we decided to get out of Dodge as soon as we got back to the RV. We got a couple of things at the RV store that we didn’t have on our list, got some breakfast and filled up with the most reasonably priced fuel in Harrisburg ($3.09 vs $3.25 just down the street). 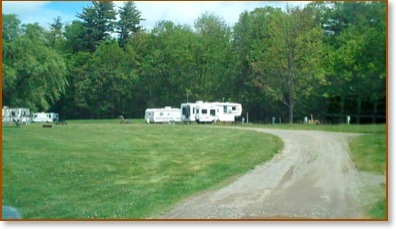 When we returned to the RV site, we noticed that it had yellow streaks streaming down as if it had been “egged”. After some sleuth work, we discovered pieces of tiny blue eggshells. It became apparent that the wind had blown some robin eggs out of a tree onto our RV. We then quickly packed up and got on the road. It was 12:30 - about 3 hours later than our typical departure. That made our projected arrival time 6:40 - assuming no stops. The strong wind was coming out of the west, so after Scranton, we had a handy tail wind. 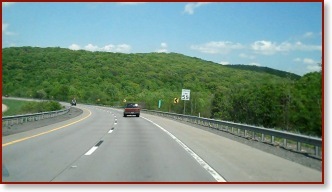 This drive was quite hilly and very scenic. We managed to maintain a 60+ mph average speed and that led to 13.3 mpg. We wanted to avoid getting any more fuel until we arrived because we saw diesel as high as $3.45 along the way. In New York, we passed within 10 miles on Cornwall, where we lived for 3 years and Geoffrey was born. 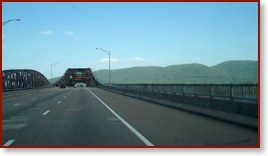 We drove west over the the Hudson River on the Beacon-Newburg Bridge . Amazingly, the car toll is $1.00. In 1970, it was $0.50. 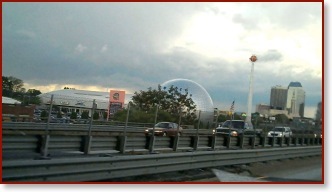 By the time we passed through Springfield, we were getting close to Hatfield, our “home town”. The picture on the left is the NBA Hall of Fame, fitting since the game of basketball was created in Springfield. Within 10 miles of our destination, the rain finally reappeared, at times quite hard. By the time (7:05) we arrived at White Birch Campground, the rain had subsided and we were able to set up on a wet site with no rain. We should also note that after 385 mile, we had not much fuel left. We managed to get to a gas station and refilled 34.4 gallons (in a 34+ gallon tank) at $2.89 per gallon. We went to Wolfies to get a bite to eat and meet with Ed, Brian and Martha. We had a great evening of conversation and vittles before returning to the RV. It must be noted that White Birch is very disappointing. Although we were told that WiFi was available, our site can’t even see a network. And we have no TV. The TV is not an issue, but no internet access is not good. Some landscaping, reasonable features (WiFi, cable, sewer) and this spot could be awesome. The scenery is excellent and the area has so much to offer. Yankee Candle is only 2 mile away. We will be here for a couple of days and then it’s off to Maine (175 miles), our final destination for the next 6 months.